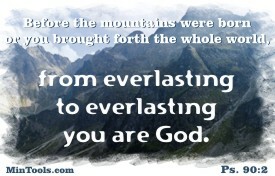 Our eternal God has no beginning or end, not locked into time but everlasting. He always was, always is and always will be through all eternity, the Great I AM. To call someone God implies not just greatness, but being the One of whom there is none greater. The God of the Bible said, “Before me no god was formed, nor will there be one after me. I, even I, am the LORD, and apart from me there is no savior.” (Isa. 43:10-11) — How can He make that claim? Because He is eternal. If a great being came into existence at some point in time, what we have is “a” god, not the God. That god would be locked into time. If he came into being, what’s to say he won’t cease to exist. A God who is without beginning or end is the One of whom there is none greater. Scripture opens with “In the beginning God …”, assuming God already existed before time began. He always was and always will be. That explains how God could call Himself “I AM” (Ex. 3:14). 1) Only an Eternal God is able to offer eternal blessings. In Him we have eternal salvation and everlasting life (Matt. 25:46; Jn. 3:15-16; 5:24; 10:28). He also gives us joy and eternal pleasures (Ps. 16:11), eternal encouragement and good hope (2 Thess. 2:16), an eternal house in heaven (2 Cor. 5:1), and an eternal inheritance (Heb. 9:15). — This gives our life here on earth, no matter how difficult it might get, increased meaning and purpose. 2) Likewise, only an Eternal God can follow through on eternal judgment (Matt. 25:46; 2 Thess. 1:9; Jude 1:6-7). — This should give us increased motivation to reach out to others with His message of salvation. 3) What He speaks can stand true throughout all eternity (Gen. 9:16; 17:7, 13, 19; Ps. 119:89, 160; 145:13; Heb. 13:20). — This gives us reason to trust His Word, covenants, and promises, even if we don’t see its fulfillment in our earthly lifetime. 4) To be God He would also have to remain true to Himself, to who He is, throughout all eternity. — This means we can count on His unfailing love (Ps. 103:17; Jer. 31:3), kindness (Isa. 54:8; Jer. 31:3), righteousness (Ps. 103:17; 119:142), power (Rom. 1:20), etc. Hence, we have an eternal Rock to stand upon (Is. 26:4) who is always out for the welfare of His people and an eternal King (Jer. 10:10) capable of ruling justly. 5) To Him belongs eternal praise (Ps. 106:48; 111:10; Neh. 9:5). He existed before us and all of creation, making Him the One of whom there is none greater. — This means no one else is more worthy of our worship. He deserves our all. God accomplished His eternal purpose in Christ Jesus our Lord (Eph. 3:11) through whom He offers a relationship with Himself and the privilege of working in cooperation with Him. His intent is to not only give us an eternal inheritance but also to bring us into conformity to His Son (Rom. 8:28-30). — Make your ambition be to line up with Him! That will set your sights on what truly matters. His “righteousness is everlasting” and His “statutes are forever right.” We should therefore be praying, “give me understanding that I may live” (Ps. 119:142, 144). To live within that abundant life Jesus came to give (Jn. 10:10), we need His perspective on life. — Make a conscientious effort to see life through His eyes. That will raise you above life’s petty concerns. God has an eternal passion for those He created which grows out of His eternal characteristics. His love, kindness, and mercy toward us will never end (Jer. 31:3; Isa. 54:8; Ps. 100:5; 103:17) and cannot be measured. Because His righteousness and holiness are also eternal, His concern goes beyond how we feel in the moment to our eternal welfare. — Make time to bask in His heart for you. That will motivate you beyond measure. We are without excuse for not trusting Him and living a godly life for “since the creation of the world God’s invisible qualities – his eternal power and divine nature – have been clearly seen, being understood from what has been made” (Rom. 1:20). “The eternal God is your refuge, and underneath are the everlasting arms” (Deut. 33:27). — Make Him the first place you turn. That will make whatever you face seem do-able. “Do you not know? Have you not heard? The Lord is the everlasting God, … He will not grow tired or weary” (Isa. 40:28). He always was and always will be God who always was and always will be true to Himself who always was and always will work on behalf of His people. Even “if we are faithless, he will remain faithful, for he cannot disown himself” (2 Tim. 2:13). — Make reflection on His faithfulness a part of your every day life. That will enable you to keep going on even when you don’t understand. Perhaps the demands of ministry seem like more than you can bear. Maybe the burdens of those you are seeking to help weigh you down. If you get your eyes off of your circumstances and onto God, you will find strength, joy, hope, and power of eternal proportions. That is a sure cure for ministry blues!